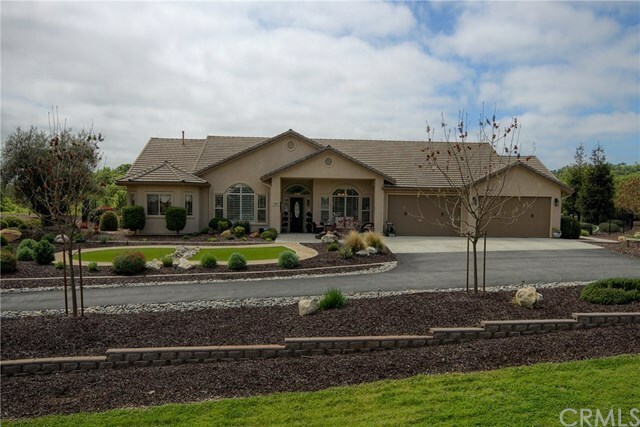 This beautiful home in gated Rancho Salinas, Paso Robles has it all...Sitting on 2.31 professionally landscaped acres the home features 4 bedrooms, 3 baths, living room w/ fireplace, formal dining room, den/office, breakfast room, and laundry room. Outside you'll find a saltwater pool and spa, a custom built covered patio complete with a kitchen including a BBQ and a sub-zero refrigerator. There are 2 fire pits, custom hardscape, solar both for the house and the pool. The rear yard is completely fenced with black wrought iron fencing. Not only are there great views from the rear yard, just outside the fence at the rear of the acreage nestled near the oaks is a horseshoe pit. The home has Cherry hardwood floors, extra plush carpeting, tile floors, granite and Corian countertops. The Master suite includes a french door to the patio area, bath with Jacuzzi tub and separate shower plus a custom built out walk-in closet. There is also a large, attached 4 car garage with lots of room for storage. There are too many more extras to list. Call today for an appointment to preview and buy this beautiful home.